Histoire résumée This aeroplane was a 60 percent scaled-down version of the Hitachi HT-3F Medium Passenger Transport that was to be flown as a towed research glider. 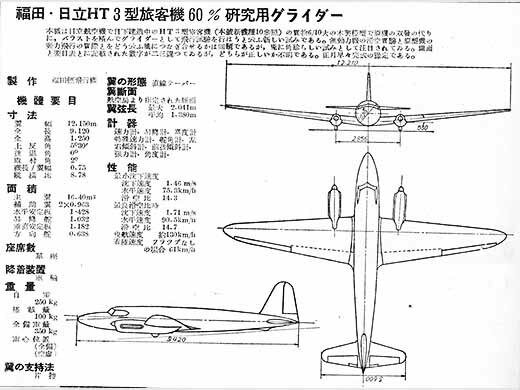 It was manufactured by Fukuda at the request of the Aviation Bureau that sponsored the development of a domestic service type transport. It was felt that better performance data could be acquired from this glider version than from a wind-tunnel model. 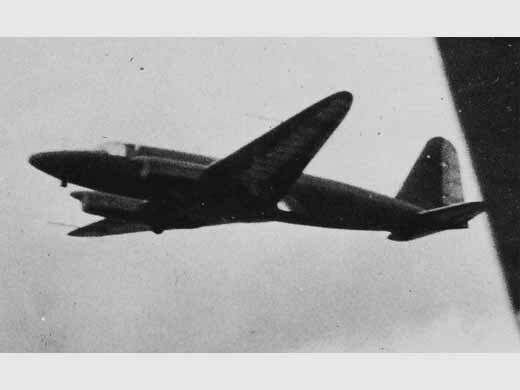 The wing aspect ratio was 8.78. As a glider, it had simulated engine nacelles as well as having the undercarriage in the retracted position. It was at this time, however, that priority was directed to military aircraft, causing the HT-3 to be terminated at the mock-up stage. Autres sources Robert C. Mikesh and Shorzoe Abe, Japanese Aircraft 1910-1941. Naval Institute Press, London 1990: Putnam. ISBN 0-85177-840-2.